Thanksgiving is just one day away! I think I’m ready, are you? I already did all my grocery shopping yesterday morning before the crowds hit the supermarkets. Since my son is out of school all this week, he was my little helper. He’s great at marking things off the grocery list now that he’s learning to read. I’ve got all my sides planned out for the big day, and the turduken is thawing as we speak. For dessert, I just couldn’t decide what type of pie to make for us, so I made this Sweet Potato Pumpkin Coconut Pie, and tomorrow I’m making a Dutch Apple Pear Cranberry Pie. I figure that if I just combine my top 6 favorite pies into two glorious pies, we’ll be fine. For this pie, I start with a big baked sweet potato that I baked in the microwave. Then I add that to a can of pumpkin puree and a can of coconut milk. The coconut flavor makes this pie amazing. I also add some brown sugar and lots of flavorful spices. But what really makes this pie is the crust. I start with the perfect pie crust recipe, the Crisco Perfect Pie Crust. It’s a no-fail, super easy way to make that incredibly flaky, tender pie crust. The recipe simply calls for Crisco, flour, salt and water. The first step is to just combine the Crisco, flour and salt with a pastry knife like so. Until it looks like this. The dough should be all grainy and lumpy looking. The next step is to add just enough ice water to get the dough to come together and form a disc. Next grab your rolling pin and roll it out on some parchment paper. Then you just flip this pie crust in your pie plate, trim the edges and your done! Just fill and bake. Does this all sound a little intimidating? It’s okay, the pie experts from Crisco are here to help. The Crisco Pie Hotline 1-877-FOR PIE TIPS (877-367-7438) is back to offer around-the-clock pie baking help this holiday season. From how to avoid shrinking crusts to creating the perfect filling, the hotline provides information and tips around the clock to assist bakers with some of the most common pie-baking challenges. Live pie experts can be reached Monday through Friday 9:00 a.m. to 7:00 p.m. ET. During the harried holiday season when pie baking is at its peak, live pie experts are on-call during extended hours, Monday through Friday 8:00 a.m. to 8:00 p.m. ET from November 18 – 27, and 8:00 a.m. to 7:00 p.m. ET from December 16 – 23. Additionally, recorded tips and tricks can be accessed 24 hours a day. The hotline will also feature tips and trends from award-winning pie expert and author, Michele Stuart, the owner of Michele’s Pies (located in Westport and Norwalk, CT) and the author of the best-selling cookbooks Perfect Pies (Random House, 2011) and the new Perfect Pies & More (Random House, October 22, 2013). In November, fans can also log on to visit the Crisco Facebook and Pinterest pages to find step-by-step tutorials, recipes and inspiration from Michele Stuart. Be sure to head over to enter the Holiday Rate & Review Promotion for the chance to win a Michele Stuart baking bundle too. Follow this link to enter. BLEND flour and salt in medium mixing bowl. CUT chilled shortening into 1/2-inch cubes. Cut in chilled shortening cubes into flour mixture, using a pastry blender, in an up and down chopping motion, until mixture resembles coarse crumbs with some small pea-sized pieces remaining. SPRINKLE half the maximum recommended amount of ice cold water over the flour mixture. 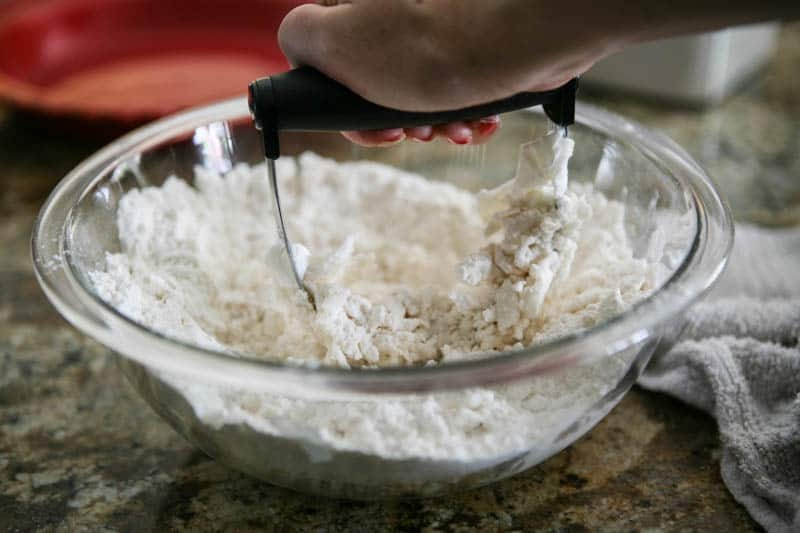 Using a fork, stir and draw flour from bottom of bowl to the top, distributing moisture evenly into flour. Press chunks down to bottom of bowl with fork. Add more water by the tablespoon, until dough is moist enough to hold together when pressed together. TIP: Test dough for proper moistness by squeezing a marble-sized ball of dough in your hand. If it holds together firmly, do not add any additional water. 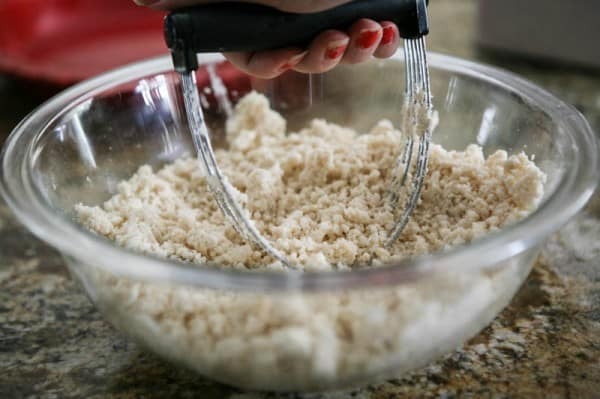 If the dough crumbles, add more water by the tablespoonful, until dough is moist enough to form a smooth ball when pressed together. SHAPE dough into a ball for single pie crust. Divide dough in two for double crust or double deep dish crust, one ball slightly larger than the other. Flatten ball(s) into 1/2-inch thick round disk(s). TIP: For ease in rolling, wrap dough in plastic wrap. Chill for 30 minutes or up to 2 days. ROLL dough (larger ball of dough for double crust pie) from center outward with steady pressure on a lightly floured work surface (or between two sheets of wax or parchment paper) into a circle 2-inches wider than pie plate for the bottom crust. 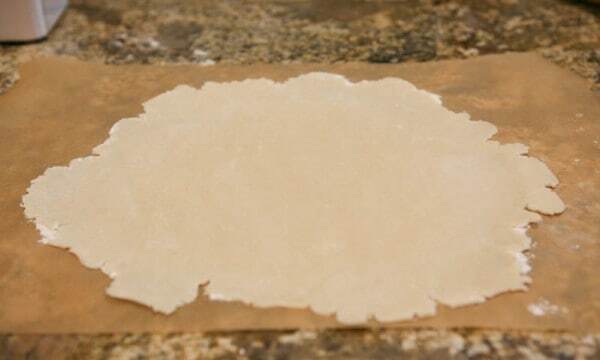 Transfer dough to pie plate by loosely rolling around rolling pin. Center the rolling pin over the pie plate, and then unroll, easing dough into pie plate. For a DOUBLE pie crust, roll larger disk for bottom crust, trimming edges of dough even with outer edge of pie plate. Fill unbaked pie crust according to recipe directions. Roll out smaller dough disk. Transfer dough carefully onto filled pie. Trim edges of dough leaving a 3/4-inch overhang. Fold top edge under bottom crust. Press edges together to seal and flute as desired. Cut slits in top crust or prick with fork to vent steam. Bake according to specific recipe directions. Microwave or bake sweet potato until tender. 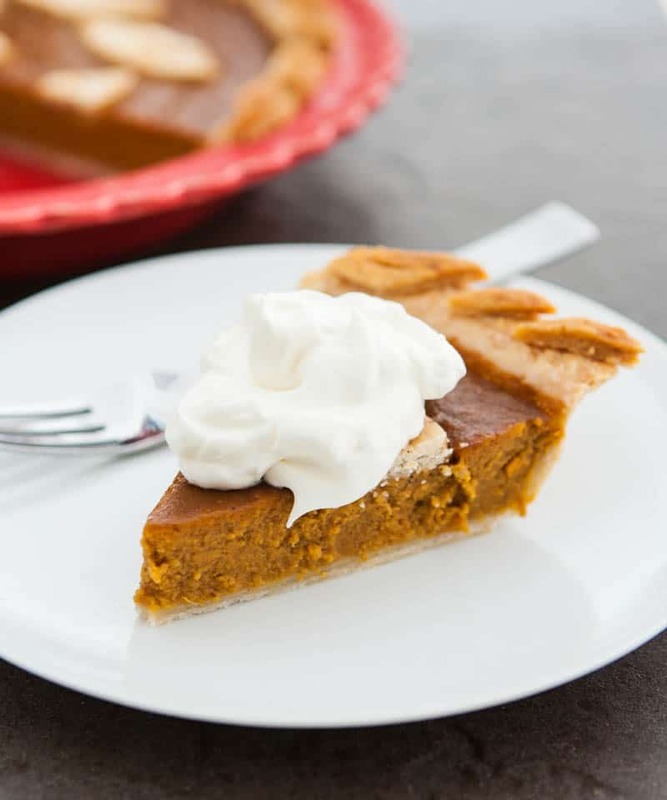 Add cooked sweet potato, pumpkin puree, coconut milk, eggs, pumpkin pie spice and brown sugar in a large bowl. Mix well until blended. Pour filling into prepared pie crust. Depending on the size of your pie plate, there may be excess filling. 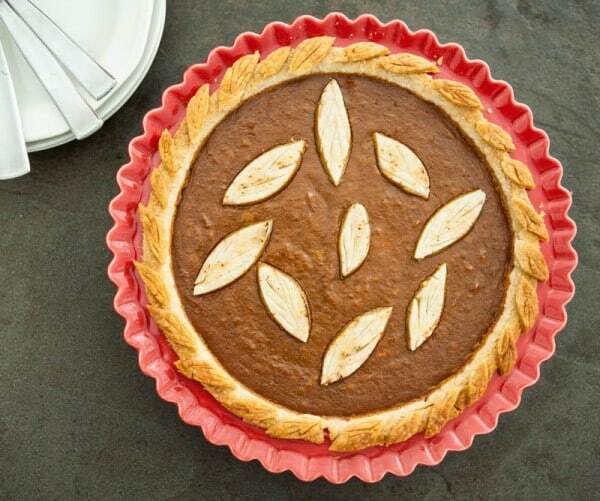 Cut leaf shapes if desired out of top pie crust with a paring knife and decorate edges and top of pie. Pie crust Recipe from Crisco.com. To enter in the giveaway just leave a comment below telling me your favorite holiday pie. 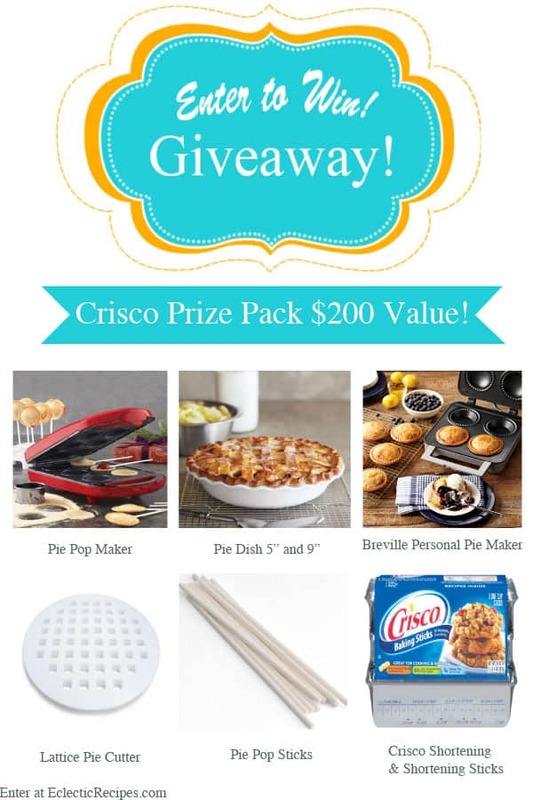 Join the Crisco community on Facebook at Facebook.com/Crisco and on Pinterest at Pinterest.com/criscorecipes. 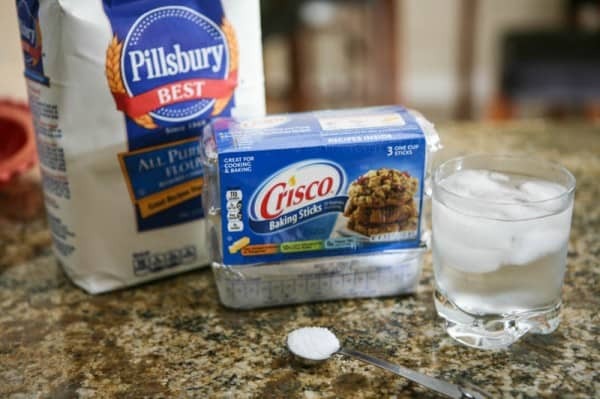 For more information about the Crisco Pie Hotline or for additional tips, recipes and how-to videos, visit Crisco.com. This recipe sponsored by Crisco. All opinions 100% mine. A beautiful pie and beautiful crust! My favorite pie of all time is mixed berry! Full of strawberries, blueberries, and raspberries! 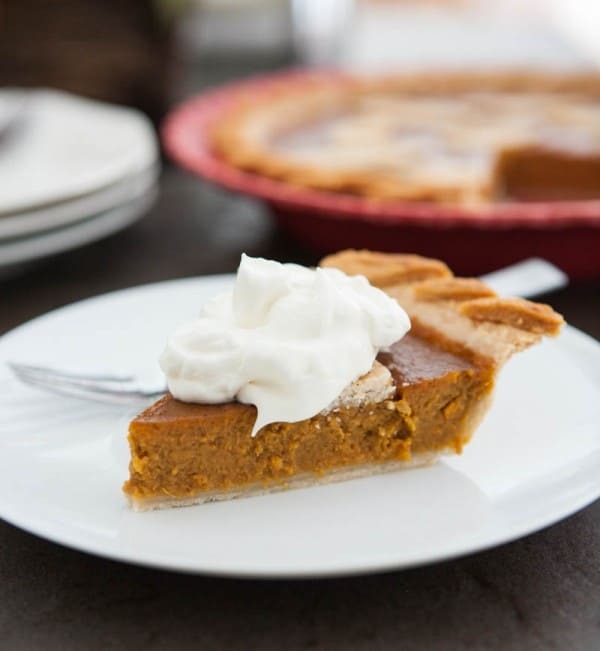 The crust is just perfection here, and I love the mix of both sweet potato and pumpkin mix. I love apple pie around the holidays. Pecan is definitely my favorite! My favorite is pecan pie. My favorite is pecan with white chocolate & fresh cranberries. My favorite holiday pie is mincemeat pie! I follow Eclectic Recipes on Twitter! I like Eclectic Recipes on Facebook! I’m subscribed to your mailing list! I love pumpkin pie, was allergic to cinnamon for many years and can finally have it again, have a lot of making up to do. liked on facebook, sorry about putting them all in one. Pecan pie is my favorite! I absolutely LOVE pumpkin pie! Everything about it reminds me of the holidays! I love French Silk pie! My favorite holiday pie is lemon meringue. I am one of your facebook followers. Sweet potato pie is my favorite. I love squash pie – probably because I only make it this time of year. Sweet Potato pie is sooo good but pecan pie may be a little better. I DO love some pie! My favorite holiday pie is sweet potato pie. My favorite holiday pie is my mom’s chocolate cream cheese pie! Thanks for a chance at the giveaway. Happy Holidays! I already follow you on Twitter ~ my user name is @poetpassionbakr. My favorite holiday pie is pumpkin! I love pumpkin pie…new favorite this year-pumpkin cheesecake! My favorite holiday pie is Pumpkin Cheesecake Pie. Thank you!